When I was younger I used to always get those chocolate oranges during Christmas time. They're the ones that are shaped like an orange and you crack them and then come apart as little orange slices in chocolate form. Those were my favorite. Mmm. I'd always get them in my stocking or after Christmas when you could get them super cheap. Loved them. But now I'm not so interested in them. Funny how things change over time, huh? Well things don't change that much because chocolate and orange is still a great combo that I don't want to miss out on! So I made these in memory of those cute little chocolate oranges. There are so many reasons that I love these. I can make a batch of these and keep them in the freezer to grab when I'm running low on snacks to go (right now, actually). They'll never let you down! 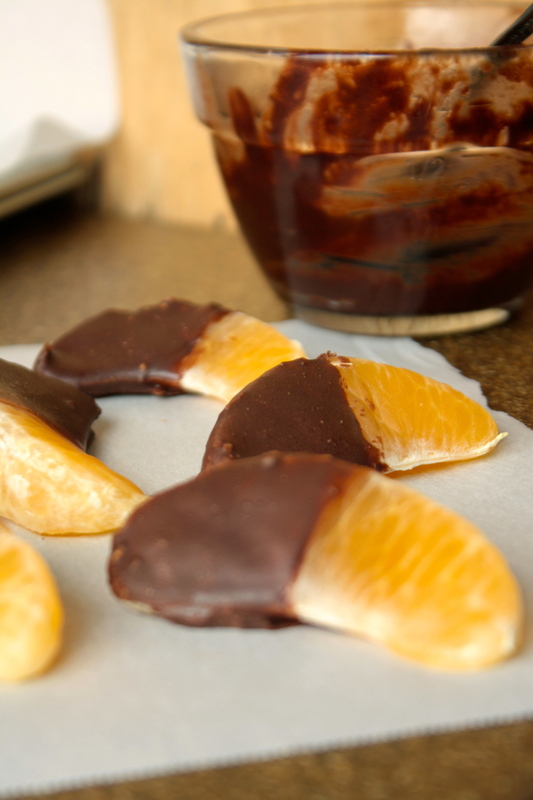 These chocolate covered oranges are quick, easy, refreshing, zesty, and sweet. I mean, I could definitely keep going with describing these. But I know that you're anxious to get to the most important part; yes, the recipe. Place orange slices on parchment paper lined baking sheet. Place in refrigerator to chill while making chocolate. Combine all chocolate ingredients together in a bowl and stir together. Let sit for 5-10 minutes to thicken up a bit. Remove orange slices from refrigerator and dip in chocolate. I dip slices in chocolate twice to get a thicker coating of chocolate on the oranges. Place in refrigerator to set up. Serve, enjoy! These can be stored in refrigerator for up to 7 days or in the freezer for 2 weeks. I like to eat these frozen just as much as I enjoy them chilled!